Supervisor Chad A. Lupinacci hosted Family Residences and Essential Enterprises, Inc. (FREE) to honor special needs artists participating in FREE’s Fine Art and Art Therapy Programs at a Meet the Artists Reception, joined by Town Clerk Jo-Ann Raia, Heckscher Museum of Art Executive Director Michael Schantz and Huntington Arts Council Executive Director Marc Courtade at Huntington Town Hall on December 12. 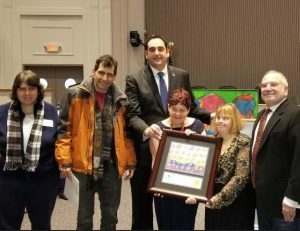 FREE Director of Art Therapy Ed Regensburg and FREE artists presenting a Partnership Award to Supervisor Chad A. Lupinacci. Heckscher Museum of Art Executive Director Michael Schantz and Huntington Arts Council Executive Director Marc Courtade delivered remarks on the importance of art in the community and our culture. Ed Regensburg, Director of Art Therapy at FREE, discussed the art therapy process FREE’s programs undertake and the importance of art therapy. At the ceremony, Supervisor Lupinacci presented proclamations to the artists in attendance, after which FREE and the artists presented the Supervisor with a Partnership Award. 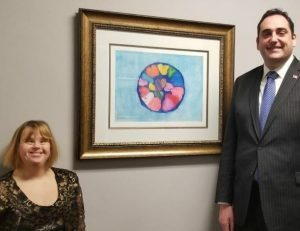 The collection, entitled “Revelations,” were created by individuals with Autism and other Special Needs who participate in Fine Art and Art Therapy programs at FREE. The artists’ works were on exhibit and for sale, with proceeds benefitting the artists and their programs, at Huntington Town Hall from November 27 through January 8, 2019. Several pieces from the exhibition were sold, including one sold to Joshua Price, Chief of Staff to Supervisor Chad A. Lupinacci, who donated the piece to the Town. The piece now hangs in the reception area of the Supervisor’s office. Supervisor Chad A. Lupinacci and Town Attorney Nicholas Ciappetta purchased one of the pieces together as a gift for Deputy Supervisor Pat Del Col, who had expressed her admiration for the piece before the end of the exhibition and is retiring in late January after 25 years of government service to the Town.